They are demanding the right to return to their ancestors’ homes, which they were expelled from in 1948, when Zionist militias forcefully removed 750,000 Palestinians from their villages to clear the way for Israel’s creation. The demonstrations started on March 30, 2018 and have continued since, despite the Israeli army’s deadly response. The Gaza Strip is a small Palestinian territory with a total area of 365km/sq. It shares borders with Israel to the north and east, Egypt to the south, and the Mediterranean Sea to the west. Israel, which occupied Gaza in1967, retains control of coastal enclave’s airspace, seafront, vehicle and pedestrian access despite ending its military presence and removing illegal settlements in 2005. In 2007, Hamas, a self-described “Islamic national liberation and resistance movement” took control of Gaza, prompting Israel to imposed a air, land and sea blockade on the Gaza Strip, isolating the enclave from the rest of the world. Egypt, which also shares borders with Gaza, has closed the Rafah crossing for the majority of the last 12 years. The Rafah crossing is the only passenger crossing Gaza shares with Egypt. The restriction on movement means that many students and patients can’t leave Gaza to pursue an education or seek treatment. Israel also controls imports to Gaza and bans almost all exports, which has led – in part – to the collapse of Gaza’s economy. According to the World Bank, every other person in Gaza is living in poverty and the besieged strip has the world’s highest unemployment rate at over 50 percent, with youth unemployment at over 70 percent. Only 5 percent of Gaza’s water is safe to drink and 68 percent of its population suffers from food insecurity, according to UN figures. Three major operations in 2008/09, 2012, and 2014 have killed more than 3,500 Palestinians, including hundreds of children and injured more than 15,000 people, mostly civilians. The impact on infrastructure has been devastating as well with schools, mosques, UN facilities, and hospitals being hit. More than 90 Israelis were also killed and hundreds injured in the three operations. Most of them were members of the Israeli army. Political divisions between Fatah and Hamas have only fueled the public’s frustrations further. The two parties have failed time and time again to reconcile their decade-long differences, despite several agreements that were signed over the years. In April 2017, the Palestinian Authority based in Ramallah took a series of punitive measures, including cutting salaries of employees in Gaza, in a bid to pressure Hamas to handover its control of the enclave. “The source of the problem is the [Israeli] occupation, that Israel is shooting and killing with impunity, that Israel is maintaining a blockade with impunity,” Buttu told Al Jazeera. His call led to weekly Friday protests, which became known as the “Great March of Return” rallies. Jehad Abusalim, a Palestine-Israel Program Associate at the American Service Committee, said the protests were another episode in the Palestinian history of popular resistance. 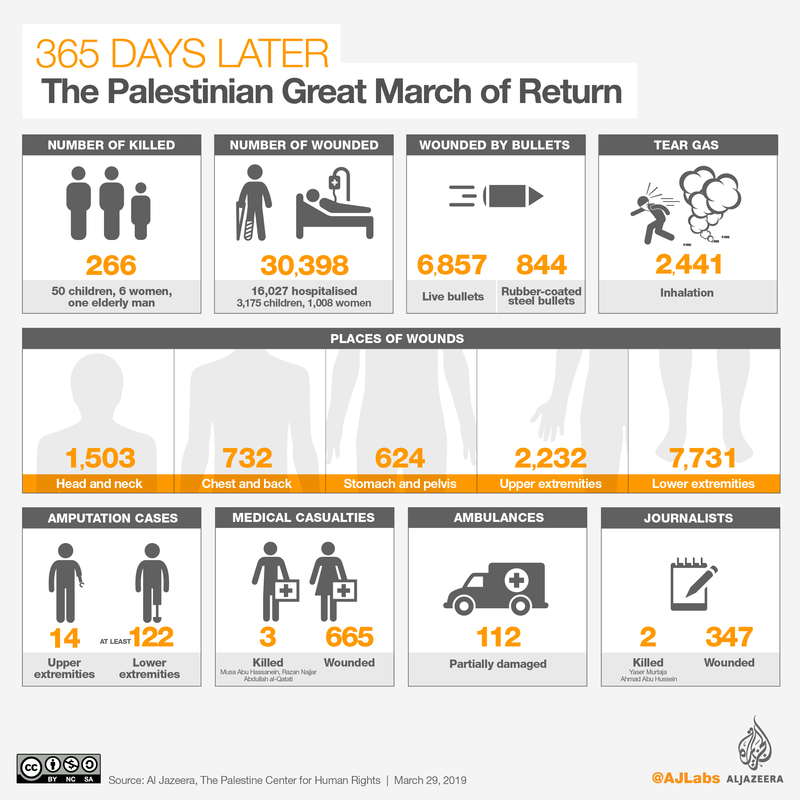 “The Great March of Return has been a grassroots social movement that included the various and diverse components of the Palestinian civil society,” Abusalim told Al Jazeera. “Political factions, NGOs, people from all across the political spectrum participated in the March” he added. “While Israel is not being held to account yet before the International Criminal Court or in the international arena, one thing that has happened is that we are seeing a sea change,” Buttu said. “This is beginning to shed a little bit of light and open a door for people to open their eyes and see what Israel is really about,” she added.